Website for a woman’s shelter in Michigan. Project in 2009 initially migrated from html based site to Drupal with Mailchimp, HelpChat and Facebook/Social Media. 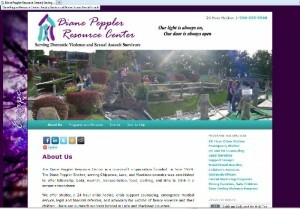 In 2012 we migrated the site from Drupal to WordPress. It’s customized theme includes a custom “escape” script feature to allow for a quick exit for visitors in abusive situations who might be walked in on by the abuser while visiting the site for information. Ongoing assistance with development of features, content and site maintenance. One of the inspirations this design was a picture that showed a field dotted with teal and purple flags from their 25th Anniversary. The flags represented the survivors of domestic violence and sexual assault that this organization has helped since it was started. This entry was posted in Portfolio, Websites on August 25, 2017 by Kathy Sweeney.